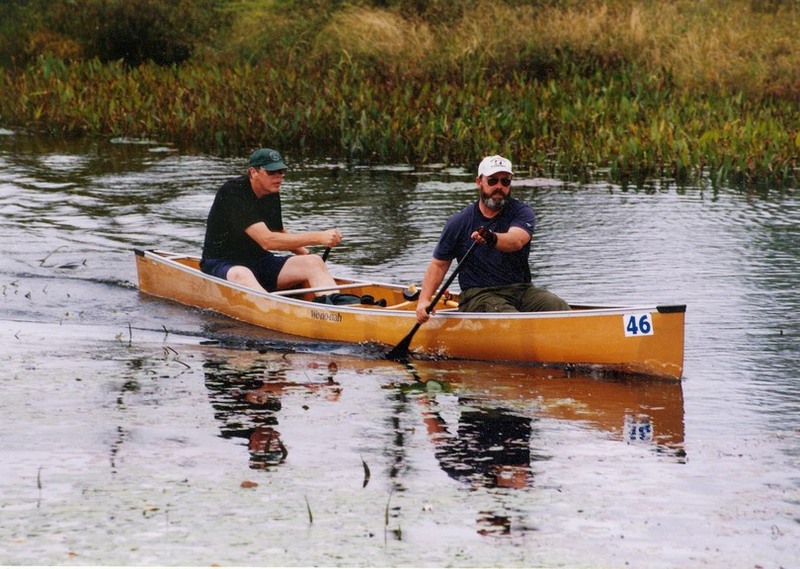 The Adirondack Canoe Classic, also known as the 90-miler, is a three-day, 90-mile (140 km) canoe race from Old Forge to Saranac Lake in the Adirondacks of New York, USA. The race draws competitors from California to Florida, New Zealand and Canada paddling 250 canoes, kayaks and guideboats. Included in the ninety mile length is 5.25 miles (8.45 km) of carries. Held every fall since 1983, the race follows routes traveled by the region’s early settlers and Adirondack guides, a chain of lakes, rivers and carries that is also the first leg of the Northern Forest Canoe Trail. The original course followed the historic “Highway of the Adirondacks”, a continuous route from Old Forge, via the Moose River through the Fulton Chain Lakes, to Raquette Lake, then via the Raquette River to Forked Lake, Long Lake and finally via the Stony Creek Ponds and the Indian Carry to Upper Saranac Lake. The route then proceeded via Bartletts Carry to Middle Saranac Lake and Lower Saranac Lake, ending at the New York State Boat Launch on Lake Flower. Over the years, the route has been adjusted to deal with the logistics of what has become a 250-boat race. The route is now broken into three discontinuous one-day segments– the endpoints are chosen with accommodations in mind. As a result, the first day’s route now proceeds from Raquette Lake via the Marion River and the Eckford chain of Lakes to Blue Mountain Lake. The race is hosted by the New York State Department of Environmental Conservation, the Central Adirondack Association, and the Adirondack Watershed Alliance. My friend Skip & I competed in the Open Touring Class in the 3 day 90 mile Adirondack Canoe Classic from Old Forge to Saranac Lake which we paddled in a little under 18 hours. We had perfect weather and it was a defining experience. Having never competed in a race this long we learned a lot & improved our portaging technique as well as, our hydrating & re-fueling process. The 90-mile Adirondack Canoe Classic started Friday at 7 a.m. from the Old Forge lakefront and finished on Sunday, September 12, in Saranac Lake Village. High water led to a new course record, a course change and fast times for the 246 boats that paddled in the 90 – mile Adirondack Canoe Classic over the weekend. The route follows the original “highways of the Adirondacks” the interconnecting lakes and rivers that stretch from Old Forge to Saranac Lake. Day three began at Fish Creek Campground, toured through the Saranac Lake Chain, then a carried around the Lower State Locks, continuing across Oseetah Lake and Lake Flower to the final finish at Prescott Park in Saranac Lake. (25 miles). The paddling field included eight war canoes – with 6 to 8 paddlers per vessel, eight guide boats, lots of solo kayaks and canoes, and tandem canoes of every paddlable description entered. In it’s 22nd year, the “90 – Miler” has evolved into an annual rite for people who come more for the experience of sharing in a unique community of paddlers engaged in a commonly challenging endurance activity, than simply to “race.” In addition to paddling, participants camp together, eat together, shuttle together, and exchange stories of past experiences on and off of the water. The 90 – Miler has been described as an every person’s event. The three days of paddling are challenging, but doable for people who have the appropriate mind set and have spent some time in physically preparing for the long days on the water. It also helps to pick the right equipment. Cut off times and locations were established to assure both participants were off of the water before dark. Participants who did not make it to the designated checkpoints prior to the cut off time had usually done enough paddling to call it a day. Brian and Grace McDonnell of Mac’s Canoe Livery in Lake Clear organized the event.